Today's article takes a slightly different approach than usual. One of the questions we often get here on the blog and in our Wednesday Lighting Q&A on Facebook is about energy-saving bulbs. Specifically, people want to know what defines an energy-saving light bulb and what makes an LED better than a CFL, a CFL better than a Halogen, or any variant on that question. With that in mind, we've recorded a short, introductory video that we hope will answer most of your questions. Of course, we'll gladly answer any remaining questions you may have in the comments section below, on our Facebook page, or on our Twitter or Google Plus accounts. You can also check out our related Squidoo article, also titled "Energy-Saving Light Bulbs." Welcome to 1000Bulbs.com, the Internet's number one retailer of light bulbs and lighting products. In today's video, we'll be discussing a very popular but often misunderstood topic: Energy-saving light bulbs. "Energy-saving" is a term thrown around pretty often these days, especially referring to light bulbs. But just what is an energy-saving light bulb? Though there is no strict definition of an energy-saving bulb, one thing is certain: It must be more efficient than an incandescent bulb. That said, energy-saving bulbs fall into one of three product types: Halogen light bulbs, compact fluorescents (more commonly known as "CFLs"), and light-emitting diodes, better known simply as "LEDs." Let's look at each bulb type one-by-one to understand their benefits. First, for reference, we have incandescent light bulbs. Though they’re old technology, they're still very common. On the plus side, incandescent light bulbs are inexpensive and completely dimmable. However, these attributes are overshadowed by how inefficient they are as well as their short lifespan. Next, we have the first of our energy savers, the Halogen light bulb. You'll notice that these look very similar to incandescent bulbs. 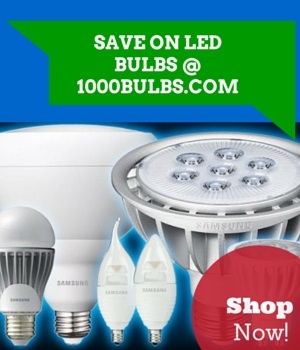 Also like incandescent bulbs, Halogen bulbs are inexpensive and dimmable. However, Halogens only last about 1,000 hours, and they’re only 15 to 20 percent more efficient than incandescent bulbs. Now we have the compact fluorescent, which is probably what you think of when you hear about energy-saving bulbs. CFLs have many positive attributes, including being relatively inexpensive, at least in comparison to LEDs, as well as lasting eight times longer than an incandescent or Halogen and using about 80% less energy than an incandescent bulb. Unfortunately, most compact fluorescents are non-dimmable. They also contain a small amount of toxic mercury, so they have to be recycled, and some people find their characteristic spiral shape off-putting. Finally, we can discuss LED light bulbs. Not only are these the most efficient light bulbs available to homeowners, they last 50,000 hours or more, and most models are fully dimmable. Of course, anything has drawbacks, including LED. These bulbs are an emerging technology, so manufacturers are still working out some of their "kinks." Also, as a new technology, LEDs are still relatively expensive, though their prices are dropping rapidly as technology improves. So let's look at these four bulbs side-by-side: An incandescent bulb produces 13.3 lumens--the standard measurement of light output--for each watt of energy used. A Halogen light bulb is only slightly more efficient, producing 16 lumens per watt. Compact fluorescents, however, make a huge leap in efficiency, producing 61.5 lumens per watt. But by far the most efficient is LED, which produces nearly 90 lumens per watt! To learn more, be sure to visit 1000Bulbs.com!